October 24, 2018 | BY: Maggie Moon, M.S., R.D.N. October 24, 2018 Maggie Moon, M.S., R.D.N. The MIND diet is about keeping the mind sharp. Americans are living longer overall, and a long life is made better by a healthy and active mind. As millions of Americans get older, losing cognitive abilities can be scarier than changes to the physical body. Could a healthy diet make a difference? There are research-backed diets designed to improve heart health, but what about brain health? Enter: the MIND diet. It is based on findings from two large population studies that came out in 2015 that linked the MIND diet to potentially slowing cognitive decline with age. The MIND diet is a whole foods, plant-based way of eating. It is a blend of the well-established Mediterranean diet and Dietary Approaches to Stop Hypertension (DASH) diet, both of which have shown some promise for brain health (see studies referenced above). The MIND diet takes these two ways of eating and optimizes them for brain health. MIND is actually short for a very long name: Mediterranean-DASH Intervention for Neurodegenerative Delay. What Are the Basics of the MIND Diet? The MIND diet covers 15 food groups, including five types of food to avoid, but twice as many to enjoy. To start, here’s a quick guide to the 10 food groups to eat, how often to eat them, and ideas for doing just that. Leafy green vegetables: six times a week. Try spinach in scrambled eggs, a kale salad, or braised baby bok choy. All other vegetables: every day. This is in addition to the leafy greens. Explore the vegetable world, especially richly colored options such as sweet potatoes, bell peppers, eggplant, or carrots. Nuts: five times a week. Store snack packs of nuts in your desk drawer, and enjoy them at the same time you would a midmorning or late-afternoon snack. Almonds, pistachios, and peanuts are all available in snack packs, or make your own mix at home with your favorites. If you are watching your weight, it’s a good idea to keep track of your portions for all foods, but particularly for calorically dense nuts. The Beachbody Portion Fix Eating Plan recommends one blue container, which is healthy fats, per day for all calorie ranges. Check out the Portion Fix eating guide for a specific breakdown of how many nuts you can eat and still lose weight. Beans: three to four times a week. Make a big batch of chili or bean stew on Sunday night, store enough for a couple days in the refrigerator, and freeze the rest to reheat later in the week. Check out FIXATE, Beachbody On Demand’s cooking show featuring 21 Day Fix creator Autumn Calabrese and her brother Chef Bobby Calabrese, for a hearty and healthy Tuscan Bean Salad that makes a great portable lunch. Berries: twice a week. Enjoy a basket of strawberries or blueberries for snacking over a couple days. Frozen berries make great smoothie add-ins anytime. If whole fruit isn’t convenient, try 100 percent, no-added-sugar pomegranate or blueberry juice. Poultry: twice a week. Easy. Roast a whole chicken one night, and use the leftovers in a chicken soup the next. Fish: once a week. Salmon with the skin on is one of the most forgiving fish to cook; all of its healthy fats keep it moist. Mangle your fish into flakes while trying to get it out of the pan? Not a problem. Tuck the fish bits into tortillas, top with salsa, and voila! Impromptu grilled fish tacos. Whole grains: one and a half cups every day. 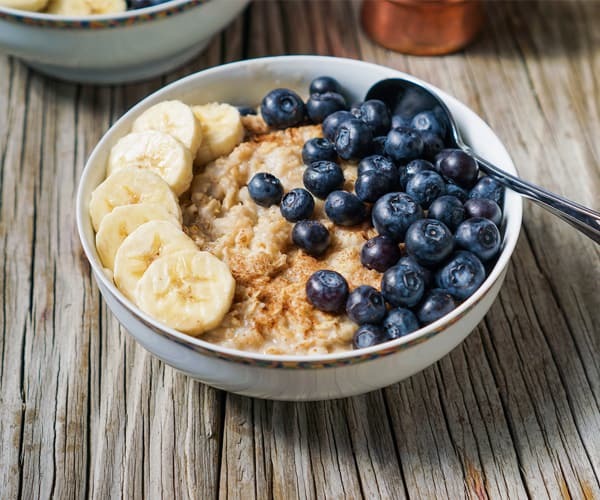 Some of the easiest fiber-full whole grains around are oatmeal and whole wheat couscous, which are both quick-cooking. Olive oil: daily. Drizzle over avocado toast or warmed tomatoes. It works great in salad dressings, of course. Wine: one five-ounce glass every day. In keeping with its Mediterranean influence, the MIND diet includes moderate alcohol, and keeps it to one glass a day. The wine could be optional if all other guidelines are followed. The five foods to avoid are high in saturated fat and tend to be low in nutrition: fried food, pastries and sweets, butter and stick margarine, red meat, and cheese. Even still, there is room for true moderation here, and most of these foods can be enjoyed sparingly a few times a week — except for fried food and cheese, which should be limited to just once or twice a month according to the diet plan. The MIND diet is simpler than its component diets because it requires less fish than the Mediterranean diet, less dairy than the DASH diet, and less fruit than either one. Overall, it has fewer required servings of grains, vegetables, fruits, and fish, and no emphasis on dairy or any limits on total fat to worry about. Truth be told, it’s not just for older adults. The MIND diet can provide a solid foundation for a healthy way to eat for just about anyone. Full disclosure: Maggie Moon is the author of The MIND Diet book.